As revealed on TechRadar yesterday, Sky's Anytime+ VOD is coming next week, with the broadcast giant confirming that the service will begin to roll out on Tuesday. Although a lack of HD streams and the exclusion of all other ISPs apart from Sky have picked up criticism, Early Sky Anytime+ reviews have been largely positive. Anytime+ adds to the already established Anytime push VOD (which does bring HD programmes) to add SD streaming and download video, and the movie section alone bring a wealth of goodies. The rollout is a staggered one, with Sky insisting that the 'majority' of Sky's HD boxes will be Anytime+ ready by the end of the year. "Sky Anytime+, Sky's new internet delivered video-on-demand (VoD) service, is to begin rolling-out to millions of Sky+HD homes," confirmed Sky's official statement. 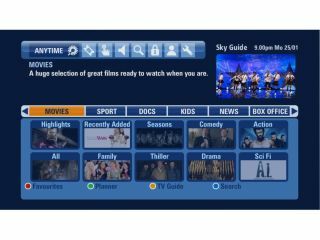 "Launching to customers from Tuesday, Sky+HD set-top boxes will be able to connect to the Sky Broadband network to access a comprehensive on-demand service, providing even more choice and control to complement Sky+ and the existing Sky Anytime 'push' VoD service." Sky's statement arrived with its latest trading figures, and the company is edging ever closer to the 10 million mark – with 96,000 new customers in the past three months bringing the total up to 9,956,000. A shade over 2.8 million people are now taking Sky Broadband, and the rise of Sky HD is clear – with 3.15 million homes able to access the 50 HD channels on offer. Stephen van Rooyen, Sky's Deputy MD of Marketing, comments: "Sky Anytime+ demonstrates the benefit of being able to use the best combination of distribution platforms in delivering what our customers want. "Through Sky Broadband customers can now explore a rich library of programming to watch on-demand through their TVs." "Meanwhile satellite continues to satisfy the increasing demand for high bandwidth services like HD and 3D, and Sky+ continues to help customers define their own schedules from the best of the week's TV," he added. "We're introducing Sky Anytime+ against the backdrop of another really strong quarter for Sky Broadband with our fastest growth in over two years. "Customers are responding to our mix of high quality, great value broadband products. At the same time we continue to increase the number of our TV customers, with millions now opting to take our state-of-the-art Sky+HD box."